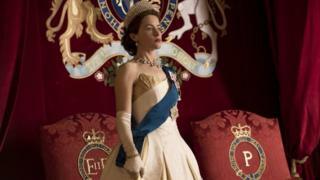 The Crown: Does Netflix series cost more than the actual Queen? Netflix recently launched the second series of The Crown, its lavishly shot (and priced) period drama about the British Royal Family. Reports have claimed the show's first series cost a record $130m (£97.4m) - though its creator Peter Morgan thinks that's nearer the total for both. Either way, it's a lot: Between $6.5m and $13m per hour-long instalment. 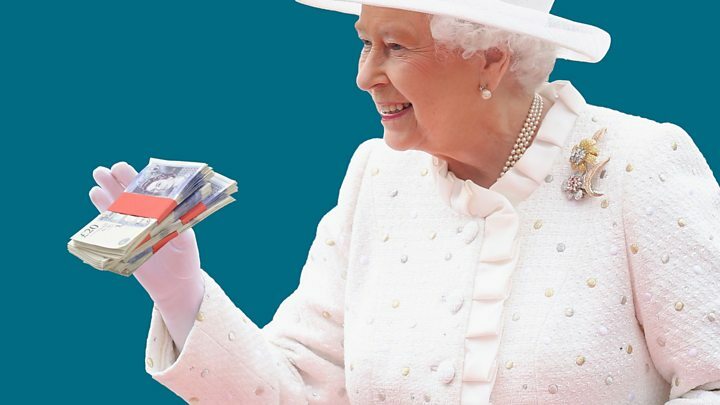 Could dramatising Queen Elizabeth II's reign have cost more than the actual Queen costs the UK? The Queen is about to get more expensive, after MPs voted to increase the Sovereign Grant paid to her by the British Treasury. She'll receive £82.2m in 2018-19, equivalent to around £2.71 per British taxpayer. The Sovereign Grant is worked out as a percentage of profits from the Crown Estate portfolio, an extensive property empire which posted a £328.8m profit in 2016-17. As royal visits, ceremonies and security are not covered by the Grant, the actual yearly cost of the monarchy is about £300m, Britain's Telegraph newspaper reports. Anti-monarchy pressure groups argue that the figure is higher. With that in mind, it seems Her Majesty and family are still costlier than their glamorous TV imitators. Verdict: The Crown is expected to run for six series. If their cost remains stable, that's either $780m (£584m) if you believe the rumours, or (on Morgan's figures), $390m (£292m). So if the monarchy does indeed cost £300m a year, that would fund three series of the Crown at worst. And, at best, all six. Media captionFrom 2017: What does the Queen cost us? Earlier this month, it emerged that the Pentagon had spent more than $20m from 2007-2012 on a secret programme to investigate Unidentified Flying Objects (UFOs). The news was greeted with incredulity. Wouldn't it have been cheaper to call Mulder and Scully? That depends how fast they work. The much-loved 90s TV series where FBI agents probe the paranormal, The X Files cost $1.5m per episode for the first five series, according to IMDB. Adjusted for inflation to 2007, when the Pentagon operation started, that's $2.1m. Back in 1997, it was a rite of passage to sob through the epic disaster romance Titanic to the ubiquitous strains of Celine Dion. Leo DiCaprio and Kate Winslet captured hearts as the doomed lovers Jack and Rose, but 11 Oscars came at a price: $200m. So which cost more, the movie or the unlucky vessel? Construction of the real-life Titanic began in 1909, and it was built and furnished for an estimated $7.5m. That's equivalent to about $127m when the film came out. Verdict: The blockbuster takes it. Seemingly, it costs more to tell the story of an ill-starred luxury liner than it did to build it in the first place. US healthcare is notoriously expensive; and the same was true of medical drama ER, which helped George Clooney shoot to stardom. In 1998, US TV network NBC offered its makers Warner Bros an unprecedented $13m per episode for the antics of Doctors Greene, Corday, Weaver et al. How does that compare to the cost of running a real ER? The John H Stroger Jr Hospital, in Cook County, Illinois, was the model for fictional Cook County General Hospital, and kindly gave the BBC a breakdown. Its emergency department takes about $41m a year to run, including staff and supplies. Verdict: That $13m equates to $19m an episode in today's dollars. On that maths, you could run the real-life ER for five-and-a-half months for the cost of just one TV instalment. Update 26 December 2017: This report has been updated to explain the calculation of the Sovereign Grant and clarify its cost to taxpayers. Video Reality Check: What does the Queen cost us?